Sub:- SSA, Mahabubabad - Conduct of Role play and Folk Dance Competitions at mandal level - Instructions - Reg. In the reference cited, the Director, SCERT, T$, Hyderabad has informed that it has been proposed to conduct state level role play competitions on 17.11.2017and folk dance competitions on 18.11.2017 at Godavari Conference Hall, 0/ o of the SSA, TS, Hyderabad for all the first prize winners at district level competitions and details of programme is as follows and instructed to send first prize winner team along with one guide teacher of role play on 17.11.2017and 18.1'.J..2017. In view of the above, all the Mandal Educational Officers in the district are requested to conduct a role play and folk dance competitions at mandal level on 14.11.2017 and submit the names of the first and second prize winners in the competitions to this office on 15.11.2017 by 11.00 iAM for conducting district level competitions. 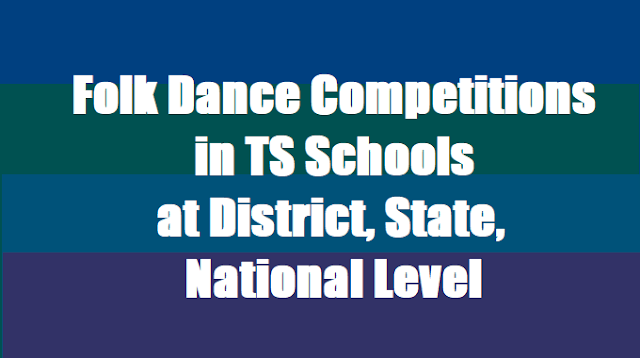 Sub: SCERT, Telangana, Hyderabad - Conduct of Role Play and Folk Dance Competitions at State Level - Reg. All District Educational Officers in the State are hereby informed that it is proposed to conduct State Level Role Play Competitions on 17.11.2017 and Folk Dance Competitions on 18.11.2017 at Godavari Conference Hall, O/o SSA, Telangana, Hyderabad for all the 1st prize winners at District Level Competitions. 1. No. of participants are upto 4 to 5 members of class VIII and IX. 2. Duration of the time 8 to 10 minutes. 1. No. of participants are upto 4 to 6 members of class VIII and IX. Therefore, all the DEOs are requested to send 1st prize winner team along with 01 Guide Teacher of Role Play on 17.11.2017 and Folk Dance on 18.11.2017 at 10.00 AM without fail to participate in the State Level Competitions at Hyderabad. The DEOs are also requested to send a Report along with the photographs of the District Level Role Play and Folk Dance Competitions conducted. Sub:- SCERT, Telangana, Hyderabad - Population Education Cell - Conduct of Folk Dance Competitions at District level in the last week of August, 2017 in 16 Districts - Reg. Ref:- Plan of Action 2017-18- NPEP, NCERT, New Delhi. The District Educational Officers of Komaram Bheem (Asifabad), Manchirial, Karimnagar, Rajanna (Sircilla), Jagityal, Peddapalli, Warangal Urban, Warangal Rural, Janagaon, Jaya Shankar (Bhoopalapally), Mahabubabad, Khammam, Bhadradri, Kothagudam), Nalgonda, Suryapet and Yadadriare informed that as per the Plan of Action 2017-18 of Population Education Programme, this office has decided to conduct Folk Dance Competitions to the students of classes VIII & IX of Government/ Panchayat Raj/ Municipal/ Aided Schools at District Level in the last week of August, 2017. (i) The number of participants should be 4-6 students for Folk Dance of each Government/ Panchayat Raj/ Municipal/ Aided Schools in each District. (ii) Duration of time : 8 - 10 minutes for Folk Dance competitions. An amount of Rs.8,500/- to conduct the Folk Dance Competition in each District. The sanctioned amount is being transferred through online to their respective S.B. A/cs. An amount of Rs.8,500/- x 15 Districts = 1,27,500/- (Rupees one lakh twenty seven thousand and five hundred only) to each District. The guidelines for conducting of Folk Dance Competitions is enclosed herewith. Therefore, the DEOs are requested to conduct the above competitions in districts as per the schedule and send 1st prize winners in Folk Dance to participate in the State Level Competitions. Further, they are requested to furnish the following information at District Level in each event-wise after conducting the competitions. All the first prize winners at the District Level would be participated in the State Level Competitions. The dates and venue for the State Level competitions will be informed later. The detailed expenditure particulars along with original bills/ vouchers should be submitted to this office within a week after completion of the above programmes along with documentation, so that following activities will be taken up at State Level. 1. The 'First Prize winners will be participate in State Level Competitions. • The students shall perform with costumes. • 4 to 6 students, boys/ girls should be participate in a Folk Dance. • Each team would be given 8 to 10 minutes time for Folk Dance at every level. • The language of Folk Dance will be local language. • The team which is selected for National Level will be perform it in English or Hindi.